Soft-tissue displacements during minimally invasive surgical procedures may cause target motion and subsequent misplacement of the surgical tool (or needle). 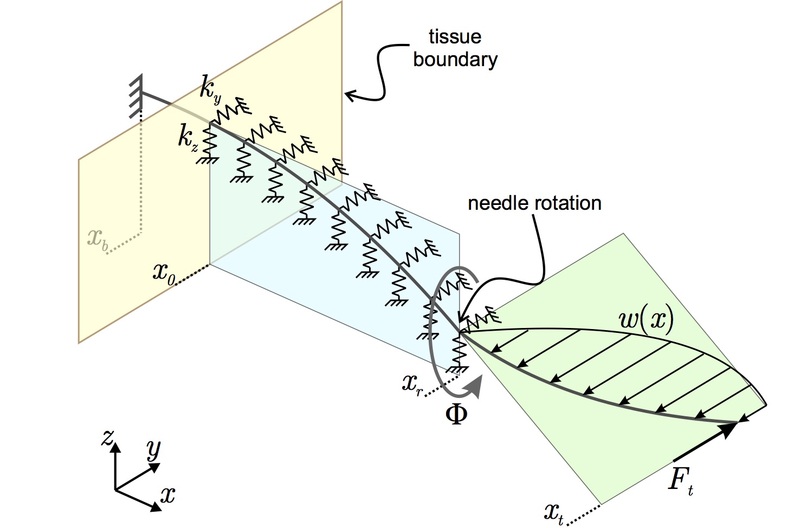 Needle-tissue interaction models can be used to predict the needle forces and deflection during insertion procedures. As part of this project, we develop models based on analytical (kinematics-based or mechanics-based) techniques, and also based on finite element (FE) methods to predict needle deflection in tissue. Non-invasive techniques such as ultrasound elastography and ultrasound-based acoustic radiation force impulse (ARFI) are used to estimate tissue properties in order to develop a patient-specific interaction model. We also develop real-time FE models to predict needle deflection during the pre-operative phase prior to the surgical procedure. Our results are also applicable for micro-needle tip designs (used for delivery of vaccinations).